Latest post Wed, Mar 6 2019 1:49 PM by SchnittKontor_HH. 4 replies. 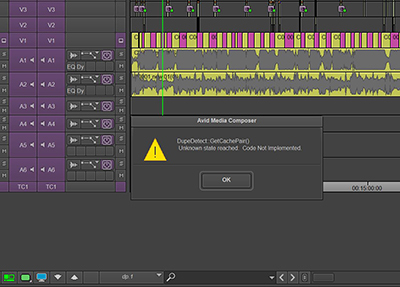 Getting the following error when I have two sequences loaded in source and record sides. If I turn off dupe detection then everything continues to work fine. If I don't turn off dupe detection then this comes up with every action attempted. Not seeing that here. Any other details you can share to help replicate? Does this happen in all projects? ​I have all my episodes in one project but it happens any time i load a sequence of shots into the source and record monitors. no matter what the sequence of shots are.